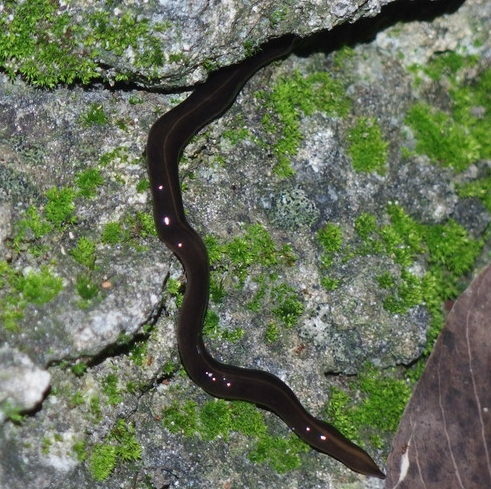 New Guinea flatworm in Coral Gables, Florida. Credit: Makiri Sei. MIAMI, Florida - The New Guinea flatworm, considered one of the 100 most invasive alien species in the world, has established itself in South Florida. Researchers believe that the introduction of the flatworm occurred recently, with the first specimens discovered in August 2012. The species is apparently now well established, with several different locations found in 2014 in Miami-Dade County, Florida. Although not a threat to humans, the flatworm feeds upon a variety of soil organisms such as earthworms, isopods, insects and snails - and is considered a danger to endemic snails wherever it has been introduced. Researchers say that the flatworm has had a serious negative impact on the biodiversity of native snail populations in the Pacific region and wherever it is deliberately or accidentally introduced it will continue to pose a threat not only to native molluscs, but possibly to other slow-moving soil invertebrates. This could then negativity impact native food webs because some indigenous animals are dependent on snails for food and plants rely on snails and other invertebrate to create fertile soil habitats. One small benefit due to the introduction of the flatworm to the Sunshine State is that it also feeds on the Giant African snail, another invasive species found in Florida. The Giant African snail poses serious health risks to humans and can be damaging to Florida's agriculture.